As a managing partner and the executive corporate chef of Wolfgang Puck’s Fine Dining Group, Lee Hefter has opened 26 high-flying restaurants around the globe, from Beverly Hills to Tokyo. But his interest in food traces back to Chinese takeout in his home state of New Jersey. Curious about Asian ingredients, Hefter took his first restaurant job at a Garden State restaurant called Wong’s, and went on to work for Barbara Tropp’s China Moon Café in San Francisco. 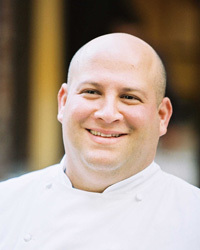 He later switched to California cuisine at Puck’s original Spago in West Hollywood, and opened the Austrian celebrity chef’s Malibu seafood spot Granita, solidifying a relationship with the chef that has spanned 20 years and garnered numerous accolades for Hefter—including Food & Wine’s Best New Chef 1998. Here, he discusses food obsessions and secret-weapon ingredients. Chinese barbecue. I am always looking for great roast duck and suckling pig. I like the sweetness, saltiness and richness coming together in each bite. There’s a lot of technique involved in the preparation, so it isn’t quite as simple as it looks. The China Moon Café Cookbook. I’m partial to it because I worked there, but it’s very, very thorough. What’s the most important trait you need to be a great cook? Patience. Some people make cooking look so easy and it gets frustrating when it doesn’t come naturally. Citrus. There are so many different types and I use them all for little sparks of flavor. I like Meyer lemon, sudachi, yuzu and kalamansi. The acid lends each dish complexity and balance. The fragrance of the oils and zest takes things to another level. What are your favorite store-bought ingredients? Different salts. Kosher salt should be a staple; it’s a very good background salt, but it’s not necessarily a finishing salt. Then there’s sea salt, which has a lot of ocean minerality and is definitely more assertive. If you use a sea salt to cook with and then try a fleur de sel at the end it can really increase the complexity of a dish. Heritage pork and beef. Boutique, hormone-free, antibiotic-free livestock is the future. People are starting to understand that eating this kind of meat is really better for you. A piece of pottery that I carried home from Japan. God knows how it made it home without breaking. It’s a footed square-shaped bowl from Sendai. They didn’t take credit cards so I used every bit of my cash to buy a few pieces. If you could create a dream project, what would it be? A simple open grill. You’d walk in and pick out your meat from a case while talking to a butcher. Then you’d take it to a grill and talk to the chef about how you like your meat prepared and he’d make it for you. You’d pick out vegetables and get a salad made for you. It would be interactive. Japanese single malts. Yamazaki 18-year is one of my favorites. I also love gin—Tanqueray No. 10 or Hendrick’s in a martini. For wine: Pinot Noir, French Champagnes and Burgundies. And I’m a big fan of beer. I really love all the new microbrews popping up across the country, like Dogfish Head 90 Minute IPA. I love salt-and-vinegar chips, and I’ll go to the Japanese market and buy all different types of rice crackers. And I love cocktail franks. My wife makes them so well. I ski and I snowboard. I usually go to Jackson Hole, Wyoming, a few times a year. Background Worked at China Moon Café, San Francisco; Granita, Malibu. How he got into cooking "I got a job in a Chinese kitchen when I was 16 to learn about food and eat for free." First memorable meal "I still remember the sashimi tuna pizza dinner I had at New York's Quilted Giraffe when I was 18." Weirdest food he's ever eaten "English food—all those organ meats and savory pies." Favorite equipment "I always keep a regular tablespoon in my pocket. I can spoon sauces and turn meat and fish with it—it's my ace in the hole." Favorite place to eat Il Mulino, New York City. What he'd do if he weren't a chef "I would make jewelry." Recipe tip When making stuffed pasta with a butter sauce, partially cook the pasta in boiling water, then finish it in the sauce for more flavor.